← It’s Raining on my Parade! Some of you know by now that Paul sells lobsters. Well, one of the places he sells them is at the Marblehead (MA) Farmers’ Market located on Pleasant Street behind the Middle School (aka the old High School – where I went back in the day). 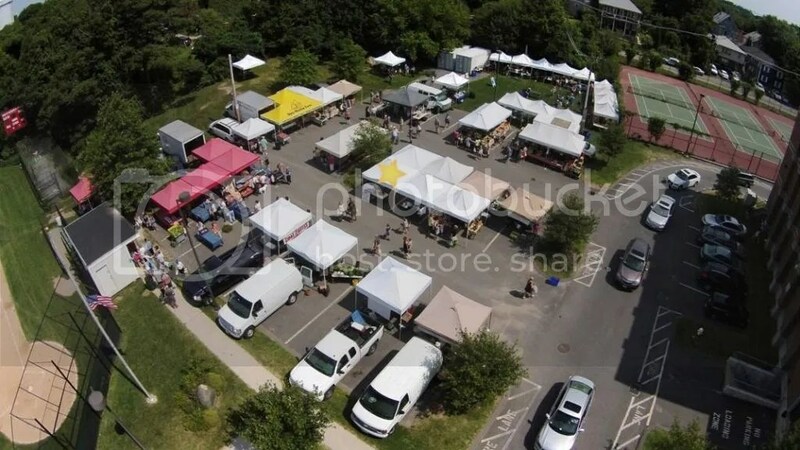 Here’s a cool aerial photo of the Market taken not long ago showing this market, and lo and behold, there’s Paul’s truck and tent down in the center bottom of the photo (I’ve marked his tent with a yellow star). He loves selling there. 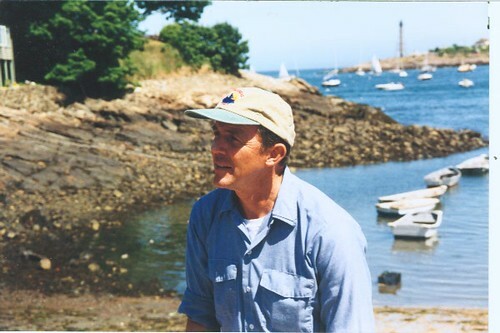 It’s a lot of work on his part to do the 3 hours (from 9-12 noon every Saturday all summer), and then he comes home and has lunch and gets his lobsters and gear back down to the harbor in Marblehead to sell from 2-5 p.m. to the public again – on both Saturday and Sunday. It’s always nice when the weather is kind – which it was this weekend. He did a nice little business on Saturday at the Market. It keeps him very busy and occupied non-stop most days with very little time to himself, but we do carve out a few hours each day with supper and our British shows afterward every day, not to mention the occasional ballgame. Now last night we were glued to the telly watching the Golf! It was a nail-biting end to four days of wonderful golf, and in the end, my pick, my favourite golfer, my guy — Rory McIlroy — came out victorious. They played almost in the dark at the very end, too. Rain had caused almost a 2 hour delay in the morning which set everyone back all day long. Rory was in the last group (as he was the Leader going in to Sunday’s rounds), so down to the wire it went. The sun had set and the sky had dark ominous clouds all around the Louisville golf course at Valhalla. There were even reports of some lightning going on in the sky, which I didn’t like one bit… (you know I am a huge lightning baby and hate seeing that stuff). Rory was behind on the last day and I was so afraid he wouldn’t pull it off, but as one announcer said this morning on the golf channel, he “manned up” at the end and won it! So enough of golf. This was supposed to be about Paul and the Farmers’ Market! I tend to get off-topic a lot. Have a super Monday everyone. I will be cooking lobsters later this week for a new cyber-friend who traveled from Oregon, where she lives, to Massachsusetts, where she grew up and has family, and we will be meeting for the first time in person, so that should be fun. (See you on Thursday, Susan!). What a dork I am. When I showed the aerial photo to Paul, he told me that the tent I had marked with the yellow star is not his! And that the white truck was not his either (it looks just like his). If you look again at this new photo I put in, I have moved his “yellow star” to where his tent really is, across the way from the previous one, on the left end of three white tents. He has to park a ways away from this area. And to Nina, yes he is a market vendor but he has been a vendor of lobsters in the Town of Marblehead since he was a very young man, since his teens, so Paul selling his lobsters down near the harbor has been a regular fixture in that town for more than 50 years, and since we both grew up there too, he knows just about all his customers. He does get to meet lots of tourists, as well, but they are usually in town for a short stay and then gone. However, he has return customers from places like Minnesota who regularly call us saying they are on their way across the country to Marblehead and to have their large order of lobsters ready for them when they get here! He does love those customers, as well as all his loyal customers from the past 50 years. I so wish we had a farmers market out here again. One that had a selection though. Been years since one was out here. People in my neighborhood would rather go pay the grocery store prices I guess. There is one down town but Wil refuses to drive down there. Neat. A friend in the UK once ran across a postcard showing a market square from a distance and realized that he was clearly crossing the square. Yes, his mustache was that prominent you couldn’t mistake him. WOW…Nice view of where he sells. Have fun with the new friend. Glad your golf guy won big time. Meeting an online friend, how fun! Have a great time, you two!